Every reader loves a good plot twist that shocks them to the core and enriches their enjoyment of a story, but some twists have been more successful than others. The author has the responsibility to ensure the twist comes as a genuine surprise, but they must also deliver it in a plausible and elegant way that falls consistent with the story and characters the reader has bonded with. The crime genre is a natural home for such a literary device, so here are my top 5 plot twists – or sudden shifts of momentum – that caused a revelation and propelled the books concerned to a higher level of critical and public acclaim. Quite simply one of the most shocking twists ever. 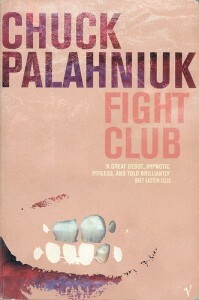 This 1996 novel, reaching a far wider audience following the 1999 film adaption starring Brad Pitt and Edward Norton, delivers a sucker punch out of nowhere that leaves the reader reeling. The unnamed protagonist/narrator, struggling with insomnia, finds relief by impersonating a seriously ill person in several support groups. He later meets charismatic extremist Tyler Durden, whose radical facade and mysterious charm fascinates him. When the narrator’s condo is destroyed in a gas explosion, he moves in with Tyler. Discovering they enjoy a fist fight as an intense form of male psychotherapy, they establish an underground bareknuckle fighting club that soars in popularity with men of similar character. As the club evolves into a militant, anti-establishment pursuit named Project Mayhem, the narrator resolves to stop Tyler and his loyal followers from engaging in their violent sabotage operations. But his mission gets complicated when the narrator realises that he is in fact Tyler. During his bouts of insomnia, his mind had created a separate personality, Tyler becoming active whenever the narrator was ‘sleeping’. It was the Tyler persona that blew up the condo, that set up the fight club. But is it too late to stop Project Mayhem? This 1926 novel is one of Christie’s most controversial mysteries, its pioneering twist at the end shaking not only the book’s readers but also the crime fiction genre itself. Set in the fictional English village of King’s Abbott, narrator Dr James Sheppard is invited to dine at the home of country gentleman Roger Ackroyd, who is distressed by the recent death of his lover, Mrs Ferrars. After returning home that evening, Sheppard receives a telephone call informing him that Ackroyd has been murdered. Belgian detective Hercule Poirot comes out of retirement to investigate, Sheppard becoming his assistant. The pair discover several characters whose own distinctive secrets point the finger of suspicion at them. Poirot calls them all together to discuss the case (sound familiar?) but later dismisses them. Because he knows Ackroyd’s killer is still in the room – Sheppard. The idea of a narrator being the murderer wasn’t entirely new, but in the hands of an expert technician like Christie, her gifts for analytical stimulation and formidable storytelling ensured the concept had never been unravelled in such a breathtaking fashion. A debut novel that became a best seller on its 2011 release, this story is beautifully crafted with a graceful finale that lives long in the memory. In a similar premise to Hollywood blockbuster Memento, Christine Lucas wakes up every morning thinking she is a twenty-something woman with a bright future. In reality she is forty seven and suffered a terrible attack eighteen years ago that has left her unable to retain new memories. The man she wakes up with is her husband, Ben, who tells her every morning they have been married for many years, and reminds her about her accident. Dr Nash, a specialist in memory disorders, encourages Christine to keep a journal that helps piece her past together. As more flash memories emerge, the details appear inconsistent with what Ben and Dr Nash are telling her. During a short vacation with Ben, Christine finds some pages torn from her journal in his luggage. It turns out that Ben is not Ben, but a man named Mike with whom Christine had a brief affair with eighteen years ago. Christine suddenly remembers that it was Mike who attacked her. Watson makes the reader question each of the characters throughout, while the smart use of the journal allows us to discover things at the same pace as Christine. The author weighs the balance perfectly between portraying Christine’s emotions and relaying the conspiracy theories that keep the story motoring along. This 2001 book was a major breakthrough for Coben, his first novel to appear on The New York Times Best Seller list and adapted into a French film in 2006. Paediatrician David Beck receives an email that makes him believe his wife Elizabeth is alive, eight years after they were both attacked by two men, leaving David seriously injured in a lake and him thinking Elizabeth had been killed. As he tries to find out if she really is alive, David discovers that Elizabeth had been wrongly blamed by a local man, Griffin Scopes, for the death of his drug dealing son. Griffin had then paid two men to kill Elizabeth and David, who after the attack was pulled from the water by a homeless man hiding from the authorities. David then learns that Elizabeth’s father, Hoyt, killed the two men who attacked them and convinced Elizabeth to leave the country for her safety, leading authorities to believe she was the victim of a serial killer. When the bodies of the two hired killers are discovered, Elizabeth realises Griffin will question her death, so she returns to the USA hoping to reunite with David. But she’s discovered and the situation hurtles towards a brutal conclusion. Twists and turns on this scale are very challenging to pull off, but in Coben’s hands the action unfolds with a deft sense of drama and credibility. A renowned 1959 thriller that was eclipsed by Alfred Hitchcock’s movie adaptation a year later, this novel deserves to go down as a crime classic. Mary Crane is on the run after impulsively stealing $40,000 from a client of the real estate company she works for. She stops at a small motel in Fairvale, California, run by middle-aged bachelor Norman Bates and his temperamental mother. While Mary takes a shower that night, a figure resembling an old woman sneaks in with a kitchen knife and butchers her to death. Mary’s sister, Lila, and boyfriend Sam Loomis investigate. At the Bates family home overlooking the motel they discover Mrs Bates’ mummified corpse in the fruit cellar. A figure rushes into the room wielding a knife – Norman Bates, dressed in his mother’s clothes. A psychiatrist examines Bates and learns that, years before, he had poisoned his mother and her lover in a jealous rage. To suppress the guilt he had developed a split personality in which his mother became an alternate self, which abused and dominated him as Mrs Bates had done in real life. The novel is fast-paced, terrifying and utterly disturbing, capped off with this shocking twist that captivated readers and opened America’s eyes to serious mental health issues.